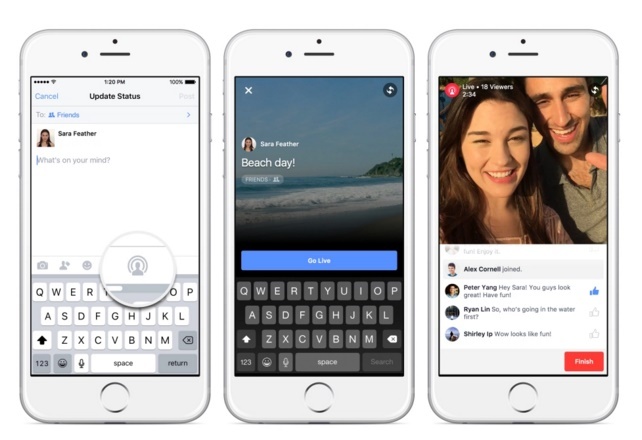 Facebook is all set to introduce its new Live Video and collages experience to users. The feature is now on testing and has rolled out to a handful iPhone devices in the United States only. The Live Video feature is nothing but an enhanced way help you interact with your friends and relatives. In general we share our pictures, videos and other updates after the event has already occurred. For example, you post your birthday pictures but only after the even has occurred, even though a little while ago. Till now Facebook did not have the facility to support Live sessions. Facebook is now testing this feature where you can invite your best friends and family to share the special moments with you in such a way that your friends will feel as if they are a part of the same event. You are on a vacation and you want to show the spectacular sunrise Live to your brother, you can! All you need to do is go to Update Status, then select Live Video. Next you have to select the person or persons with whom you want to broadcast the Live telecast. The users will be notified via Facebook notifications and they can join the broadcast if they want to. Now you can shoot the video and show it to the members. If the members want they can subscribe to you so that they can get to know the next time you broadcast something. The feature seems to be fun filled and interesting. It’s obvious that iPhones will be getting the feature very soon and Android will also get it once it’s ready.